This set of Chemical Process Calculation Test focuses on “Pressure and Hydrostatic Head-III”. 1. If a pressure of 400 Pa acts on 20 m2 area, what is the value force? 2. Given that both liquid A and liquid B exert the same amount of pressure, what would be the height of column of liquid A if the density of liquid A is twice the density of liquid B and the height of column of liquid B is 10 cm? 3. Atmospheric pressure is the pressure at a point due to the weight of the air above it. Explanation: Atmospheric pressure is the pressure at a point due to the weight of the air above it. Explanation: 25 psia = (25*29.92)/14.7 = 50.88 Hg. Explanation: 40 psia = (40*101.3)/14.7. Explanation: 56 in Hg = (56*14.7)/29.92 = 27.52 psia. Explanation: 1 atm = 29.92 in Hg. Explanation: 760 mm Hg = 1 atm = 33.94 ft H2O. Explanation: Piezometer is used for the pressure measurement of only liquid. Explanation: If the open end manometer`s open end is closed and in the blank area there is vacuum. The manometer measures absolute pressure. 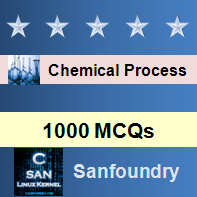 To practice all areas of Chemical Process Calculation for tests, here is complete set of 1000+ Multiple Choice Questions and Answers.